This article focuses on the Raspberry Pi’s with the 40 pin GPIO connector. 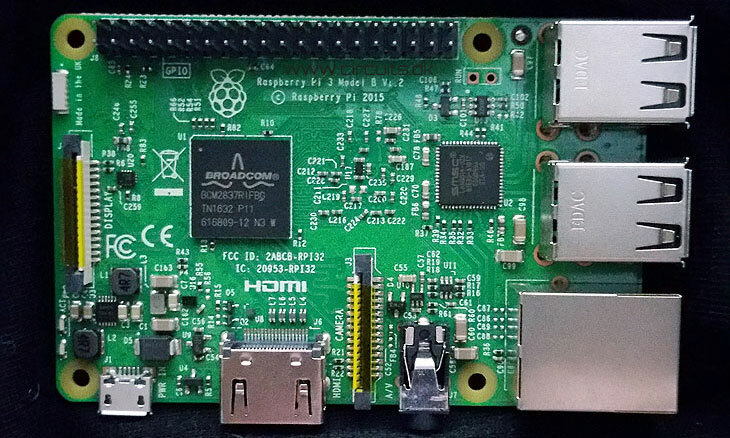 In addition to the familiar USB, Ethernet and HDMI ports, the Raspberry Pi offers the ability to connect directly to a variety of electronic devices. Digital outputs: turn lights, motors, or other devices on or off. Digital inputs: read an on or off state from a button, switch, or other sensor. Communication with chips or modules using low-level serial protocols: SPI, I²C, or UART. 1-Wire bus can easily be implemented in software using any io pin. No analog input or output is available. However, add-on “HAT” boards such as the “ADC PiZero”, “ADC-DAC PiZero”, “Automation HAT” etc. provide this capability or you could add an ADC/DAC board yourself. PWM outputs: 2 pins can be programmed to output PWM pulses. PWM is useful when you want to dim a LED or make a poor man’s Digital to Analog Converter (DAC). The Raspberry PI GPIO’s use 3.3V logic levels and are directly connected to the Microprocessor chip. Hence, if connecting these pins to 5V or higher without level conversion circuitry is a bad idea and will damage your Pi. The pin header is marked J8 on the circuit board, and arranged as 2×20 pins with a pitch of 2.54mm. So what do these pin numbers and names mean? “GPIOxx” is referred to the Broadcom chip pin number usually referred to as “BCM” number. These are the ones you probably will use with RPi.GPIO and Pigpio libraries. The pin numbers of Fig.1. next to the pin is the actual physical pin number on the 40 pin connector. Here you will also find the pin numbers used in the WiringPi library marked as “wPi”….which can be useful. Fig. 3. GPIO pinning using gpio readall bash command. The measurements are of course done with nothing connected to the GPIO port. The total maximum recommended current draw from the two 3.3 V power output pins is 50 mA. Maximum recommended current draw from the 5 V pin is the USB input current (usually 1 A) minus any current draw from the rest of the board. Handle the 5 V pins J8-02 and J8-04 with caution, because if you short 5V to any other J8 pin you may permanently damage your board. Before connecting your multimeter or oscilloscope probes to the J8 connector it is a good idea to isolate the +5V pins with some short pieces isolation sleeves stripped off a wire or something similar to avoid accidentally shorting pins. All GPIOs revert to general-purpose inputs on power-on reset. These are CMOS 3.3V logic pins and are not 5V logic tolerant. A voltage close to 3.3 V is interpreted as a logic one while a voltage close to 0V is a logic zero. There is no over-voltage protection on the board – the intention is that people interested in serious interfacing will use an external board with buffers, level conversion and analog I/O rather than soldering directly onto the main board. A GPIO pin should never be connected to a voltage source greater than 3.3V or less than 0V, as prompt damage to the chip may occur as the input pin substrate diodes26) conduct. There may be times when you may need to connect them to out-of-range voltages – in those cases the input pin current must be limited by an external resistor to a value that prevents harm to the chip. I recommend that you never source or sink more than 0.5 mA into an input pin. Never demand that any output pin source or sink more than 16 mA. 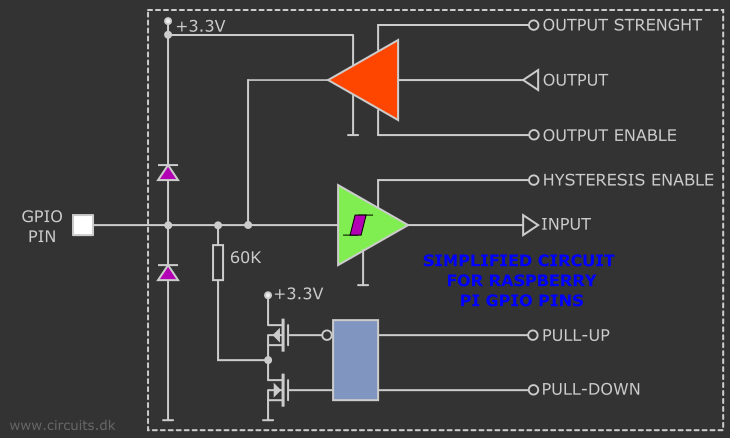 Current sourced by the outputs is drawn from the 3.3 V supplies, which can supply only 50 mA maximum. Consequently, the maximum you can source from all the GPIO outputs simultaneously is less than 50 mA. You may be able to draw transient currents beyond that limit as they are drawn from the bypass capacitors on the 3.3 V rail, but don’t push the envelope! There isn’t a similar limitation on sink current. For sink current, the pertinent limitation is that imposed by maximum chip power dissipation. Even so, you can safely sink up to 16 mA each into any number of GPIO pins simultaneously. In the worst case, the output pins (if configured to the 16mA high current drive capability) have a maximum output low voltage of about 0.4 V27), and their internal circuitry dissipates only 6.4 mW worst case. Even sinking 16 mA into 16 pins simultaneously would produce only 0.1024 W, that is, about a tenth of a watt. However, depending on the source of the current, transient sink currents may make demands on the board’s bypass capacitors, so you may not want to switch all the outputs to sink the maximum current synchronously, if you require fast, clean transitions. Do not drive capacitive loads. Do not place a capacitive load directly across the pin. Limit current into any capacitive load to a maximum transient current of 16 mA. For example, if you use a low pass filter on an output pin, you must provide a series resistance of at least 3.3V/16mA = 200 Ω. The Linux kernel is not suitable for real time applications – it is a multitasking O/S and another process may be given priority over the CPU, causing jitter in your program. If you are after true real-time performance and predictability, buy yourself an Arduino http://www.arduino.cc ! Or make an add-on board with a small microcontroller which handles time critical code and let the RPi handle what it does best; ethernet connection, user interface, usb, bluetooth connection, WiFi, etc. If you need fast execution of your IO program use the C programming language. For example, if you just want to flash a few LEDs or read a temperature sensor in a human time scale then you can write in almost any language. However, if you want to directly interface with other systems and control externally connected hardware at its full speed then C is your best choice. Similarly, if timing is critical, then C is the only way to go. Python have too much overhead, it is interpreted while it is running. C runs machine code directly because the program is translated to machine code when you compile your C-source code. That makes C-code not as portable as python. Python can run on many different systems. C-code needs to be recompiled to a specific system/chip before it is able to run. All the GPIO pins can be reconfigured to provide alternate functions, SPI, PWM, I2C and so on. 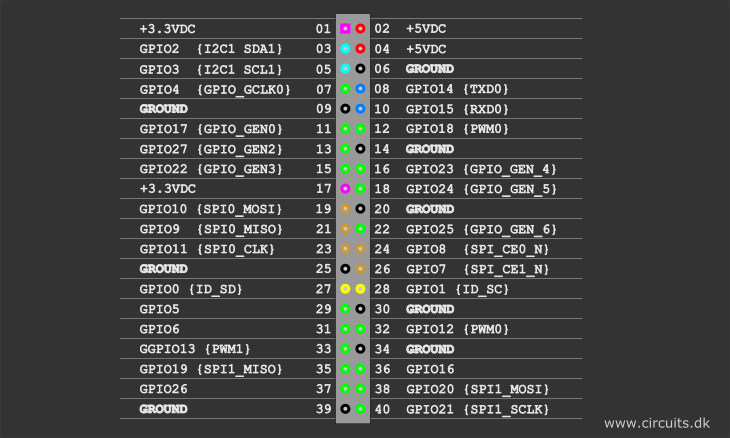 At reset only pins GPIO14 and GPIO15 are assigned to the alternate function UART, these two can be switched back to GPIO to provide a total of 28 GPIO pins. Each of their functions and full details of how to access are detailed in the chipset datasheet [Ref.3]. Interrupt means that instead of having to keep polling the GPIO for changes the operating system will be notified when a change occurs. Level interrupts maintain the interrupt status until the level has been cleared by system software (e.g. by servicing the attached peripheral generating the interrupt). The normal rising/falling edge detection has a small amount of synchronization built into the detection. At the system clock frequency, the pin is sampled with the criteria for generation of an interrupt being a stable transition within a 3-cycle window, i.e. a record of “1 0 0” or “0 1 1”. Asynchronous detection bypasses this synchronization to enable the detection of very narrow events. GPIO input hysteresis (Schmitt trigger) can be on or off, output slew rate can be fast or limited, and source and sink current is configurable from 2 mA up to 16 mA. See GPIO Datasheet Addendum – GPIO Pads Control. [Ref.4] Particular attention should be applied to the note regarding SSO (Simultaneous Switching Outputs): to avoid interference, driving currents should be kept as low as possible. The available alternative functions and their corresponding pins are detailed below. These numbers are in reference to the chipset documentation and may not match the numbers exposed in Linux. Only fully usable functions are detailed, for some alternative functions not all the necessary pins are available for the functionality to be actually used. For further tips and tricks on how to use the UART see this post. Can be done in a huge number of ways with different programming languages. Python and C is probably the most used programming languages used by the Raspi users. 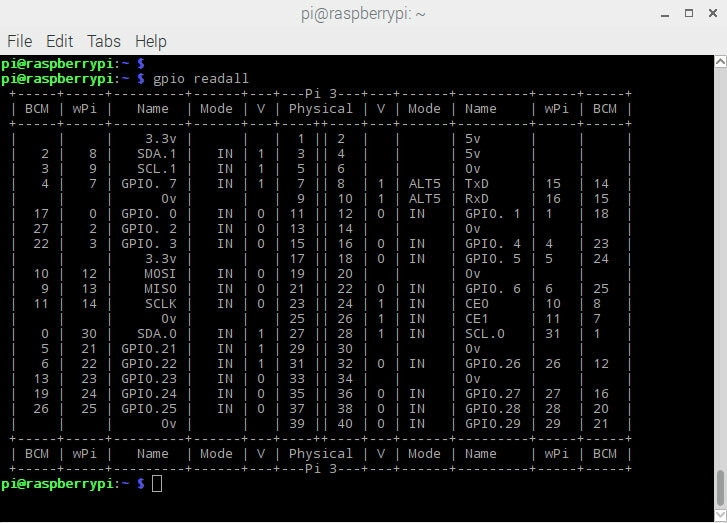 There exist a number of libraries to ease the GPIO programming and here we will mention; RPi.GPIO, Pigpio and WiringPi. The GPIO pins on a Raspberry Pi are a great way to interface physical devices like buttons and LEDs with the little Linux processor. If you are a Python developer, there’s an easy but fairly limited library called RPi.GPIO that handles interfacing with the pins. In just three lines of code, you can get an LED blinking on one of the GPIO pins. The newest version of Raspbian has the RPi.GPIO library pre-installed, so assuming you’re running that most popular Linux distribution, you don’t need to download anything to get started. 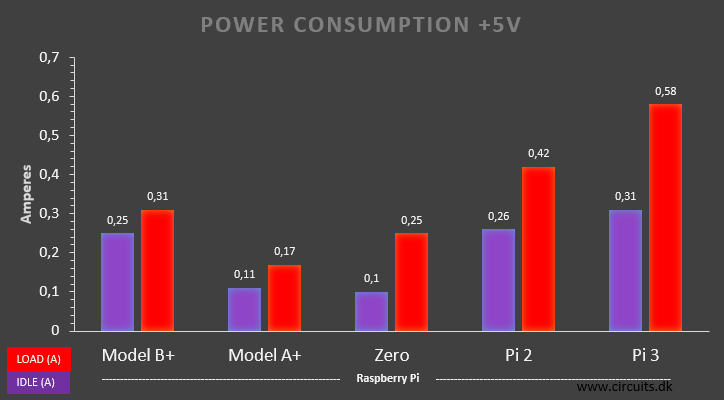 Note that the current release does not support SPI, I2C, hardware PWM or serial functionality on the RPi yet. This is planned for the near future. One-wire functionality is also planned. Note that this module is unsuitable for real-time or timing critical applications. This is because you cannot predict when Python will be busy garbage collecting. Follow along as we use the basic RPi.GPIO functions to create a simple example GPIO script. This program tells the GPIO library to look out for a falling edge event on pin 23 of the GPIO header. The function named buttonEventHandler is registered as the callback for the event. The program goes round the while loop making the red LED blink. When the button is pressed, buttonEventHandler is called, and the green LED is turned on for 0.5 second. The event is handled by a different thread, so while the green button is on, the red light continues to flash uninterrupted. Press CTRL+C to exit the script. Pigpio is a library for the Raspberry which allows control of the General Purpose Input Outputs (GPIO). Pigpio works on all versions of the Pi and it is included in the latest Rasbian “Jessy” distributions. The pigpio library is written in the C programming language. The pigpio daemon offers a socket and pipe interface to the underlying C library. A C library and a Python module allow control of the GPIO via the pigpio daemon. There is third party support for a number of other languages. A command-line utility is included which can be used to program and setup the GPIO pins. You can use this to read and write the pins and even use it to control them from shell scripts. Additionally, you can easily write your own expansion modules to integrate your own peripheral devices with wiringPi as required. Python wrapper for the wiringpi can be downloaded here. RPi Low-level peripherals – A Wiki with tons of details on using the Raspberry Pi’s GPIO peripherals. WiringPi Hompeage – The home of WiringPi and a variety of other Raspberry-Pi-related tools. Check it out! RPi.GPIO Homepage – Home of the Raspberry Pi GPIO python module. Great source for API and documentation.